Have you invented or created something that is making you money? Then I would love to talk to you. Please email me at info@caddesignhelp.com and I will consider you for a podcast slot. Alan Beckley is an entrepreneur, inventor, and podcaster. His degree is in aerospace engineering but worked a lot of his career in project management. In 2012, he hit it big with an invention of his, the Wonder Wallet. Today he continues to invent but also but also focuses on helping other inventors to succeed with his website alanbeckley.com, which has webinars for inventors, online courses, and his podcast, called Inventors Helping Inventors. Alan and I discussed in detail exactly how he went about inventing his product, from initial idea to the final licensing deals with As Seen on TV and Direct TV and retail sales. If you are an engineer at a mid to large company, you are well aware what PLM is. But if not, hopefully this episode will teach you a few things. Product Lifecycle Management (PLM) is how companies organize the process of creating and modifying products. Traditionally this applied to just the CAD data itself. This is important because if multiple engineers are working on a file, the system will keep the data organized so that everyone knows what the latest revision is and the status of the project (is the CAD in process, under review, or ready for tooling, and so on). John is the CEO and founder of Upchain.com. Upchain is changing PLM by organizing the entire supply chain, not just the CAD data. This makes the entire product management smoother. After the CAD is done, other departments still have work to do like getting quotes for tooling. Upchain organizes this process. Amy Simpkins is a speaker, author, and thought leader in innovation and the CEO of renewable energy startup, muGrid Analytics. She’s an MIT-trained aerospace engineer who caught the entrepreneurship bug and loves facilitating massive leaps forward for individuals and organizations. She’s recently published her book, Spiral: A Catalyst for Innovation and Expansion and believes that innovation is for everyone and holds the key to both personal fulfillment and lasting global change. We discuss Amy’s journey from her days as an engineer with Lockheed Martin to her current role as CEO of muGrid. At Lockheed, Amy worked on projects like low earth orbit satellites and acoustic vibration issues in astronauts’ ears. Amy wanted to move into entrepreneurship, so she left Lockheed. She had a few failures, as most entrepreneurs do when they first get started. But now she has a book published and is successfully running muGrid Analytics. MuGrid is a renewable energy business that creates custom energy storage solutions for private companies and municipalities. This episode focuses on some important business aspects of being an engineering entrepreneur: things like asset protection, insurance, and tax strategies. Scott is the founder of Royal legal solutions. His company specializes in asset protection for entrepreneurs. This includes what insurance to get, how to best structure your business for tax savings, and what to do when you get sued. Finally, we talk about lawsuits and what to do if you get sued. Jason Burt is the owner of Evolve Holdings, which is a consultancy that focuses on teaching and applying the principles of Lean Manufacturing. Lean Manufacturing started off as the Toyota production system and centers around a continuous improvement culture and taking waste out of the manufacturing process. The first half of our conversation is about lean manufacturing and some examples. The second half of our talk is about the lean startup philosophy. The lean startup is about not wasting time adding features to a product without first testing to see if anyone wants those features. What you want to do is create a MVP (minimum viable product) and test with customers before putting more work into it. And when you get feedback from customers, you want to revise the product accordingly and test again. This is where 3D printing can be helpful, as it is very cost effective to edit and create a new version of a product. One of the most important things to take care of in the invention process is figuring out how to pay for all the steps needed to get your product to market. Unless you have a trust fund or a high paying job, you will likely need help getting your product to market. It will take thousands (if not more) dollars to go from idea to final product. Costs will include CAD design, prototyping, market testing, advertising, production and so on. Matt King is an expert in helping entrepreneurs get the funding needed to start their business. He runs Titan Consulting, located in my home city of Charlotte, NC. In this week’s podcast, Matt and I talk about the right way to go about getting funding. To put simply, you should not go from your napkin sketch to trying to raise $20M. There are many steps before that and we discuss how to do it with practical examples. Jay Gibb is a software engineer, but he is also an entrepreneur. He has started 2 companies, Arizona Bay and Cloudsponge (links are at the end). Arizona Bay is a consulting firm that builds custom software. Cloudsponge is a digital asset (a product) that makes it easy for people to recommend your website to a friend. The easiest way to explain it is, imagine you just booked a place on Airbnb and want to recommend it to friend (or all your friends). Most websites have a place where you can type in each and every name, but good luck remembering all your friend’s email addresses. Cloudsponge solves this by integrating with your address book and you can simply click next to each name you want to send the Airbnb listing to. Jay and I discuss how each business operates and how he came up with the idea for Cloudsponge. His advice: the best products come from solving your problems first and finding out many other people have the same problem. We also touch on machine learning, which I didn’t know a lot about previously. Cool stuff! This episode is one that you inventors out there should definitely listen to. Most people know what a patent is but not many understand the process it takes to get one. In this episode I talked with James Wilson from the United States Patent and Trademark Office (USPTO). James is the Assistant Regional Director of the Elijah J. McCoy Midwest Regional Office in Detroit. We talk about the entire patent process, from idea creation to provisional patent, to non-provisional application and the review process. We uncover all the details inventors want to know, like costs, time frames, and the process. There are some links from the podcast I will add once I get them from James. But those will be for the resources he described including how to get assistance on patent applications. James’ parting advice is that the UPSTO strives to be one of the best government entities and that they are looking to hire more examiners. So if you are a professional with a technical degree, there might be an opportunity for you at the USPTO. It’s not often the title of my podcast is about another podcast, but that is the case this week. Nathan Kemmerer (also a mechanical engineer like me) runs the Innovation Freak Podcast, which is a podcast that covers new innovation/technology around the world that has a positive impact. Nathan also has some 3D printers of his own that we discuss, including the CR-10 and Tevo Tarantula. Jeremy is the engineering director for Enventys Partners. He just got back from Startup Bus where his team, Sak Labs placed 2nd in the competition with the Dadsak, the world’s first fully integrated infant carrier and backpack diaper bag. I have worked with Jeremy on quite a few other projects. In this podcast, we talk about the Dadsak invention and the Startup Bus. We cover many topics that will be of interest to inventors, including initial concepts, prototyping, provisional patents, and pitching investors. Matt Holling is the engineering manager at Dezignworks. His company specializes in reverse engineering using both laser scanning and bridge CMM. If you don’t know what that is, listen to the podcast, we go over it. Matt and I have done a lot of work together. While there are many ways to reverse engineer a part, laser scanning is becoming one of the most popular ways and I am often having him do this for me. Once I have the model, I can make edits to the model (add holes, threads, mirror the part, etc). One major misconception about 3D scanning is that you simply scan a part and instantly have a usable CAD file. The reality is far from this, as the scanner itself only creates a point cloud file. We go over ALL the steps needed to go from the scan, to an STL file, and finally to a fully defined Solidworks file. His company has created a proprietary Solidworks add in to do this work, and the software is impressive (the software also works on Autodesk products). Ryan Turk and I first met about 3 years ago on Upwork.com. He was looking for an engineer to assist in his new business venture. His idea was to create custom dive masks using 3D scanning and 3D printing. He ended up hiring another engineer, but he did successfully make custom masks. We talk about how he accomplished that, through 3D scanning, using Geomagic software to process the scans, and 3D printing the molds for the masks. Even though he could create the masks, the business opportunity is not quite there now. The costs are too high given the price point he can get for the product. So, for the time being, Ryan has changed paths by taking a job at Formlabs. He is working as the business development lead on mass customization. His new role is the find opportunities in the market to use 3d printing to make end use parts, not just prototypes. Five years ago (2013) Rob was getting married in Jamaica. Everything went well except when Rob saw his wedding photos, he was shocked. His shirt collar was a sloppy, droopy mess. He does not like wearing ties, so he started looking for another solution. He searched online but every existing product was a collar stay and that just didn’t work. He set out to make his own solution. His first prototype was made from a cardboard box. He spent years developing the design, especially the material. One major challenge was he needed to find a plastic that could withstand dry cleaning machine temperatures (up to 700F). We discuss his journey. He had a failed Kickstarter, he tried different marketing methods, and we talk about the patent process for him. If you are an inventor, this is an invaluable episode for you to check out, as Rob went through EVERYTHING to get his product to market. We have hit 50 episodes of the podcast! Nathan Hirsch is a serial entrepreneur, hiring expert, and the CEO of FreeeUp.com. He has hired hundreds of freelancers to build his companies and has been featured on over 100 business podcasts sharing his knowledge on hiring and entrepreneurship. We talk about entrepreneurship strategies and marketing. Nathan has grown Freeeup.com with hardly any marketing dollars. Instead he has used word of mouth by being a guest on various podcast, including Entrepreneur On Fire. He started Freeeup.com because he saw the importance of outsourcing tasks that are not his main skillset, and instead focusing on what he is best at. I often do this myself, as I outsource podcast editing, website work, and other tasks that are not related to engineering. Tony Whatley is a mechanical engineer from Houston, Texas. He is also a serial entrepreneur. Since he was 18 years old, he has worked in the oil and gas industry. He started out as a pipe fitter. He earned his college degree while working full time in the oil and gas industry. Tony has worked his way up into a project management role. But during all of this, he always had a side hustle. His most successful side hustle was a website about cars, specifically GM aftermarket parts. The site had so many visits that it was generating $400,000 a year in recurring revenue. He sold that website in 2006 for over $1 million. Tony gives some great tips about taking your dream and making it a reality. He is moving into consulting to help other people achieve success like him. You can contact Tony at 365driven.com. Johnny McLendon is a Photographer and Certified Drone Pilot. He uses a Phantom 4 Pro. He uses his drone for creating maps and videos for large industrial facilities. We discuss the technical aspects of drones. I don’t personally own one, but I have some friends that do, and I have seen them in action. I’m impressed with how stable the video is and how they can float in one place. One interesting fact I didn’t know: Drones needs GPS to maintain location. If GPS is unavailable (like when flying inside), you will need to manually maintain the position. We also tie in 3D printing to the conversation. Johnny can create 3D contour maps from the data the drone collects. This can be used to 3D print a scale model of the land. This week my guest is Michael Graham. He is an engineer with HP, working on the multijet fusion printer. In his spare time, he works on his own inventions using Cubify Software and a Prusa i3 printer at home. We discuss that invention and then move into many other topics about 3D design and 3D printing. I hope you enjoy it. This week my guest is Dean Piper. He is the founder of mUVe 3D, which is the manufacturer of open source SLA printers. The website is muve3d.net. I have quite a bit of experience running the Form2 resin printer for over 6 months now, so this conversation was very interesting to me. We talk in detail about DLP versus laser printers. We discuss why SLA printing seems to be more reliable than FDM printing (this is my experience). There is a lot of technical talk in this conversation, which I think many of you will enjoy. We also cover Dean’s background and how he started the business. I’m very tempted to purchase one of his machines and I may do that in the future. I’ll be sure to make a podcast out of my experience if I do. This week my guest is Jan Witowski. He is a medical student in Poland and has taken the lead for developing medical applications for 3D printing in his university. The main application so far has been for surgeons working with liver surgery. We talk about how he creates the 3D files using CT scans. This was very interesting, as I had no idea a CT scan could create a 3D image. Jan then uses Blender to assemble various parts so the models can be printed in separate pieces and put together. We discuss the importance of working with open source software (like Blender) and using lower cost 3D printers (Ultimaker 2 for example). While there are others out there making 3D printed parts for medical applications like him, they are using much more expensive software and printers. We also touch on Bio-printing, which is printing living tissues. Brian spent a lot of time in the past few years interviewing leaders in the 3D Printing industry and has nearly completed a documentary film about 3D printing. We discuss his journey on how he started that project and what he learned along the way. Then we move into a discussion of how 3D printing, robotics, and AI can improve the education systems, as well as how these 3 areas will change the business environment. This week we have Jerry Lepore. He is the CEO of Spectra3D, which is a 3D focused development company located in Asheville North Carolina (my home state). Spectra3D specializes in 3D printed investment casting patterns and tooling, as well as Cosplay props & more. They use Stacker and Fusion3 Design 3D printers. His top tips for the Engineering Entrepreneurs? Chris Kaminsky runs MI3D.co, which is a professional networking association focusing on all things 3D. The group is located in Grand Rapids, Michigan. Chris is a Mechanical Engineer by degree, currently working for GM. He started the MI3D so he could get together with other 3D printing enthusiasts. They meet once a month and have had guests such as reps from Ultimaker, Autodesk, and more. We talk about how he came up with starting the group and his future plans for the group. Then we move into some 3D printing projects he has done (like making molds for chocolate). His number one tip for the engineering entrepreneurs: Get to know people. Even if the meeting isn’t what you wanted. This week I will do a review of one of my 3D printers. The printer is the F400 from Fusion3. Fusion3 is a relatively new and small company based out of NC. The F400 was my 2nd 3D printer I purchased. My first printer was a Cube3 from 3D systems. That machine was so bad that 3D Systems does not even sell it anymore, but it did teach me the basic of FDM printing. I consider the F400 my first “real” 3D printer. Before I get into what I like and don’t like about it, I will first explain a little about this machine and why I decided to purchase. I purchased this machine is August 2016, price was approximately $5000, I think just a little under. The machine is a FDM type printer and has a build volume of 14” by 14” by 12.6” tall. At the time of purchase, I really needed a machine that could make big parts and this seemed to be the best one I could find under $10,000. It is a big machine, and that’s crucial for my business. I get inventors who come to me all the time with product ideas in the 8-12” range and most FDM printers are not quite big enough. It can run any material up to 300C glass transition temperature (i.e. melting temp). This means I can run basically any common or exotic material. It has an enclosed build chamber. This is extremely important if you use ABS filament. One of my other FDM machines is an Ulitmaker2+ extended (let’s call it the UM2). While I like that machine and use it often, I have found that I can only run very small parts in ABS on it. Why is that? Well ABS plastic tends to warp a lot. The reason is because it shrinks a lot as it cools. Therefore, you need an very hot (100C) environment the entire time it is printing, or some areas of the part will cool before other areas. If that happens, the parts will often crack. So I can get away with small parts on the UM2 because it is near the bed, but a tall part will not be near the bed, which is kept hot at a constant 100C. On the F400, since it is fully enclosed, the heat is maintained throughout the entire part. Lastly, the customer service is awesome. I heard it was good before I ever bought from the, and I knew I needed that because if you buy a 3D printer, you have a lot to learn to get it right. What don’t I like? Not much but I had one MAJOR issue at the start that I can’t leave out. This story goes way back to August 2016. The first 3 months I had the machine, I didn’t have a lot of issues. But then things changed. A lot of the issues had to do with clogged nozzles and jams. One thing that is important with 3D printing is that the bed is very level and the gap between the nozzle and the bed (called the Z gap) is just right. I just kept having problems, no matter how many times I went through both the level and Z gap process. It was really confusing and both me and the support guys couldn’t really figure it out. I even went as far as renting a van, packing the machine into it, and driving 2 hours north to Greensboro for them to troubleshoot it right there. That took basically an entire day and cost me a few hundred dollars to rent the van. Not a week after I got back home, it started acting up again. A month later, they agreed to completely swap out the machine for me. I just paid the shipping on the new one. I want to say this was around December 2016. For the new few months, I would still have intermittent issues with the new machine. I was extremely frustrated and I estimate I spent 200+ hours of my time in total troubleshooting it. I did ultimately get everything to work, and the machine has been nearly flawless the last 5 months. What I think did it was the light sensor. The light sensor is on the moving hot end and it basically live calibrates the level of the bed as it prints. I think this part was the culprit the entire time I was having problems, possibly with both machines. It is ironic that I basically tried everything else that support and I could think of before finally replacing this part. Ever since I replaced the light sensor, I really haven’t had any issues. That wraps up my review of the Fusion F400. In summary, I think it is a great machine, albeit a little pricey compared to other FDM printers. I think also a lesson learned here, is that 3D printing is tricky and sometimes you will just get unlucky and have an issue like this and try all the wrong things before you finally try the right thing. Lee Williams and Steve Guilmetter are the founders of coaster-track.com. Their invention is a miniature roller coaster that consists of mostly common hardware parts but also some 3D printed parts. The coaster is a fully functional mini replica. Both Lee and Steve are mechanical engineers that have a passion for roller coasters. Their business plan for this is to make 80% of it open source. Meaning, they will give away 80% of the information needed to build a track. The only thing you will need to purchase are the rail ties and the car. Right now, they are 3D printing these 2 components. Their next step is to launch a Kickstarter campaign. Their goal is to raise $50,000 to pay for injection molding tooling for the rail ties and maybe the car. The campaign will launch September 5. I will send out a link once I have it. We discuss their background, the inspiration for the coaster, and how they went about designing and building it. Justin Shook was featured on episode 3 of the podcast and he is back, just about 1 year later. Last time we talked, he was running his business Shookideas.com. Me and him were both basically doing the same thing, running a product design and 3D printing service company. He has shifted his focus to a new business. He is now running a very successful 3D printing manufacturing operation making products for fans of old school video games. His business specializes in the making cases specifically for the Raspberry Pi computer. A lot of the cases look like old video game systems like the SNES, Nintendo 64, etc. His business website is https://collectorcraft.com/. I think Justin is at the forefront of a shift in manufacturing. It used to be that 3D printing was used only for prototypes. Now it is used to manufacture products in serious quantity and Justin has taken this farther than anyone I have ever talked to. If you would like to reach out to Justin, you can go to his website. Julian Merghart is the founder of Blackened Industries (inspired by the Metallica song). His company sells CNC cut aluminum phone cases. I’ve never see that before. He also started and is still working on his own 3D printer. He desired to make his own printer after being disappointed with the size of the desktop Makerbot Clone he had. He looked at larger 3D printers but the price point was too high. He has put his design (in STEP format) available for download on his site. He is still working on finishing the design and 1st prototype. Robert Bowerman is the inventor of the Window Wizard, which is a tool to line up window frames and curtain rods to make sure they are level. The product is quite simple, but like any product, the process of getting it finished for sale is not simple. Robert hired my company off of Thumbtack.com and from his sketches and information, we were able to make a CAD file of the product and 3D print a prototype. At that time, the product was a 2 piece design that slid into place and was glued to stay. It was originally made that way because the idea he had was that the injection mold would be too expensive if it was made in one-piece due to the size of the mold. After meeting with one of my molding partners (PDQ South), we determined that indeed a one piece product made more sense. I updated the CAD file and the tool was made. Robert just got his first pieces from the tool and a little more touch up work is needed to be 100% ready. After college he took a job with Halliburton, but despite excellent pay was experiencing job burnout. He decided to take a 40% pay cut to do what he really loves, which is design engineering. He says he is very happy with the decision. In addition to his day job, he has a light up bottle cap invention that he is working on. It is patent pending and we discuss the next steps to the design and bringing it to market. I’ve helped him a little bit with the design. Amie D Dansby (she goes by Amie DD) is a software game programmer, previously at Marvel Studios, working on Captain America and other titles. She then transitioned to Research and Development working with the PlayStation and Xbox. Currently she works at ATAT Tech, a robotics, augmented reality video game studio in Dallas, TX. She went to school for game simulation and programming. We talk about how the video game industry has changed from writing games in code to now mostly being done in programs like Unity3D (using a graphical interface). Then we turn the conversation into how she uses 3D printing for interactive video games. I didn’t even realize this, but now there are video games that integrate physical objects. For example, in this LEGO game, you have to first build the structure, then use your phone/tablet to scan it and the same structure appears in the game. Really cool stuff!. She is using 3D printing at her current role in ATAT to create physical prototypes to test this concept on their games. I think dabbling in code (or using a program like Unity3D) is good. Learn how these virtual assets get made. Sort of like learning CAD. 3D printing is great for problem solving. He has invented 5 or so products that solve some real problems, like the joystick issue and the shoe lace issue. The coin sorter solution on his youtube page is quite impressive. Daryl Gibson is a thought leader and consultant in future trends, lean startup/agile methodologies, and building cultures of innovation. He is a serial entrepreneur, having start multiple businesses. His current project is InnovativeX, which is a site that provides the tools and resources to enable anyone to develop an idea from concept to market. We explore his business with a few examples in the product development space. First, we discuss his idea of a board game that teaches the players the product development process. Then we discuss my product, The Selfie Glove, and what I have done and what I should do to continue market testing. I always assumed you needed to get sales right away to validate a product idea. But Daryl points out that you can give away samples and still test. If you give out samples and people say “hey where can I buy this”, then likely the product will be worth pursuing. Matthew Gorton is Mechanical Engineer who has transitioned from employee to entrepreneur. For many years, he worked at WL Gore, in both Arizona and Delaware. (WL Gore is best known for the Gore-Tex Brand). As an aside, I also worked there as a summer intern in 2006. Matt has since left that job to pursue his passion of 3D printing as a full time career. His business is PrintedSolid, which is both an online and brick and motor 3D printer retailer. He sells many desktop 3D printers and materials, mostly the ColorFabb brand. We discuss his transition into entrepreneurship. Then we get into a lot of 3D printing details and details on new materials for 3D printing. We also discuss a new metal desktop 3D printer. Matt followed his dreams through and the business is succeeding. Don’t doubt yourself when you want to pursue your passions. While we discussed many aspects of 3D printing, one of my big takeaways is how many different materials there are and that I need to experiment with more materials like he is doing. Jon Klinger has worked in the past for Caterpillar and Rubbermaid (now called Newell Brands). He has designed many interesting products, including edge belt conveyors, thermo-formed polycarbonate doors for the Skid steer D series, and Rubbermaid Fast Track parts. Jon also is now working for me part time. In addition to his work history, we talked about the differences between Creo and Solidworks (both are 3D modeling programs). Jon has worked on many different types of products, made from different manufacturing methods. This makes you a better designer and engineer to have a diverse background. He also has learned many programs including Creo, Solidworks, and Ansys. Jen Davis-Wilson worked for 12 years at IDEO. Since then, she has gone off on her own to be a startup freelance consultant. She typically works with clients in the San Francisco (Silicon Valley area). While Jen and I are both Mechanical Engineers, our careers and the way we go about creating client projects is quite different and it was interesting to hear a different perspective on the process. One of my creations, the Led Zeppelin Object. I’ve found that fans of classic rock bands love re-created retro things you can’t find anymore. It was interesting to see how Jen’s process is compared to what I am used to. She tends to work with bigger startups than my company and as a result seems to have a bigger team on her end, often backed with IDEO employees. It was also interesting to discuss the Solidworks work flow versus Industrial design CAD tools. While I prefer Solidworks because it is easy to update a file, I can understand why some designers work in other programs that are not parametric. And from my experience, some shapes are easier in other programs like Blender (and Jen mentioned Rhino). We had a good discussion about product testing. Some companies will make renderings to see if people will buy a product before it is made. However, traditionally big companies will use focus groups and interviews. Shame McLendon and I connected when he found my CADdesignhelp.com Facebook page. He was looking for guests on the Built in a Day Podcast. I went on the podcast and talked about product testing with the Selfie-Glove. This was in the fall of 2016. Shane and I hadn’t talked in a while, so we did a podcast to catch up and throw around business ideas. Shane has quite a few side hustles, mostly as a copywriter. His current project is Theboxcrusher.com, which is a website to give blue collar workers ideas of how to get more customers for their business (think plumbers, welders, lawn mowing). We also through around ideas on other products that might be good for me to make. The trick I have found about selling online is that you need to offer something a lot of people want. One big hit I have had is the Led Zeppelin object. We discuss some other products that might be good. Have a big list of ideas to try. You really don’t know what’s going to work until you try it. Who would have guessed that old VCR tapes would be popular? Look for gaps in the market. I think Shane is onto something with his com website. There is an opportunity to teach blue collar workers concepts like the lean startup method. Terry Gonzales is currently an Engineering Manager with Stanley Black and Decker in Southington Connecticut with hand tool and auto mechanic group. Terry was my first boss at my first job out of college. That was at United Pet Group in Blacksburg, VA (we called it Tetra because that was the main brand). It was great catching up with Terry. We hadn’t really talked for a while in years. Both of our careers have gone different directions since our Tetra days. While I have gone the entrepreneur route, he has done a few different things and we discuss it. He started out in product design, then worked as sales engineer, then as a manufacturing engineer and now he has come full circle back to his passion, product design. This is a great episode for anyone thinking about engineering as a career. You get a great feel for what you can do in the working world. And of course, we talk about some 3D printing! Don’t be afraid to try new things. Terry went from Tetra to Trimech because of his skills in Solidworks. The work was different but you never know what you will like doing until you try it. Terry was spot on about the need to practice your 3D modeling. I would say it took me a full year at 40 hours a week before I felt like I had mastered Solidworks. Scott Hoffman is the founder of PepperNickelDesigns, a CAD design and 3D printing service. Scott’s background is in electrical and computer engineering. He works full time as an insurance adjuster but he started PepperNickelDesigns as a side hustle that he wants to bring to a full-time job in 2017. We connected on the Facebook page for the Side Hustle Show (http://www.sidehustlenation.com/). He posted on the Facebook page that he had issues with either too much design/print work coming in at once or not enough. This is an issue I am very familiar with, as I have been running my business full time for 2 years now. I replied to his post and offered him to come on the podcast so that I could help him with the strategies of how to solve some of these issues. Jeff Funderburk is the inventor of the Big Bear Shelf (bigbearshelving.com). Jeff was cleaning his garage one day and realized he didn’t have enough storage space. He went to Lowe’s to find a solution but all the products out there were very costly. Jeff’s solution was to create a “holder” piece that holds 3 two by four pieces of lumber. We discuss how he made some initial prototypes, came up with funding, found a CAD designer to help him create a plastic version for mass production and how the product is selling to date. The key to any successful invention is to find a problem that the market doesn’t already have. While there were shelving solutions, many were too costly for the average homeowner. In addition, often the best inventions are the ones that solve a problem you have yourself. It was smart of Jeff to test the product. He wanted to make claims it could hold a certain amount of weight for a set period of time. Threads and clearances, had to print a few times to get it to fit right. Check out images here. See the clearance between the red and grey of the section view when zoomed in? Trey Sullivan is from Louisiana and grew up on a farm. He learned a lot of hands on practical knowledge from fixing farm equipment. He started college after high school, but ultimately dropped out and worked most of his career as an insurance adjuster. He has now decided to go back to college (at 39) and this time is pursuing a Mechanical Engineering degree (which is what my degree is in). Trey reached out to me as he has a lot of questions and wanted some advice about engineering and 3D printing. He asks a lot of great questions and I think that if you ever wanted know the basics of how 3D printing works, this is the podcast for you. We talk SLA versus FDM. FDM printing is generally what you will see in colleges, makerspaces, etc. SLA is different and uses a liquid resin that is cured by light. 3D printing versus 2D printing. My opinion is that 3D printing will never take off like paper printing (in the sense that everyone will have one at home). We discuss why I think that. Pat Sweet has worked most of his career as an engineer in the rail industry. After reading the 4 hour workweek and some other entrepreneurship books, he got the inspiration to start some side hustles. He taught himself how to build websites and still creates websites as a side business. Another action he took was to create his own website: Engineeringandleadership.com. At first he created it because he enjoyed writing about engineering and leadership, but the site rank has grown and he has been able to monetize it. We talk about his journey, how to validate a product, and where he sees his future: as a product consultant. You might just want to hire Pat as a consultant on your product! He knows his stuff. Jonah Dorman is the owner of SOC3D, which is a 3D printing company based out of Grand Rapids, Michigan. His company has the most reviews on 3D Hubs (think of AirBnB for 3D printers) in the entire state of Michigan. They have 35 3D printers in use, which is truly amazing. I learn a lot myself on this call about 3D printer filament formulation, how they actually make printer filament, how to run parts fast, and we discuss all my headaches with my 3D printer I’ve had lately! ASA is going to be the replacement material for ABS. ABS was never created for 3D printing, it was made for injection molding. Jonah is probably the first person I have seen that has so many different printers (and types of printers) that he can fully optimize for any type of part. For example, tall but skinny objects are perfect for a delta printer. Brian Walt is only 22 years old but already is a business owner and entrepreneur. He started Walt3D, a 3D printing and manufacturing services company based out of King of Prussia, PA. We connected over Instagram, as we both often use the #3D printing (you can follow me on Instagram @caddesignhelp). We talk about his story on how he got into 3D printing. We talk about the Pro Putt, a golf training product he helped design and prototype. Then we discuss the 3D printers he uses and the ones I use. We talk a lot about 3D printing, so be sure to check this one out if 3D printing interests you. Brian gave a great piece of advice about 3D printing, which is that there are so many ways you can use it. If you want to get started yourself, pick a market you like. Then if you want to get a machine to make parts, make sure the machine can make the parts you need. Some of the less expensive machines may not necessarily get the job done. You can always reach out to me at info@caddesignhelp.com and I can help you out. David Frankel is inventor whose background is in sales and marketing. He found a need himself to keep a dress shirt collar upright when he is not wearing a tie. After finding a makeshift solution (his daughter’s headband) for the sales meeting he was about to have, he knew he was onto something. He took the idea from that initial handmade prototype to a final product that he is selling online and in many retail stores. We go into depth about all the stages of getting the product from his initial idea to the final product with packaging. Don’t underestimate the value of a well-designed package. In my opinion, I do not think David could command a $20 price point for his product if he did not have a well-presented package to portray the value of the product. Emanuel Moshouris is a Mechanical Engineer working for Black and Decker. His background includes working as an engineer in both the automotive and entertainment sectors. If you ever wondered how the big-name artists create their elaborate on stage performances, you will want to listen to this episode. Really interesting stuff! Emanuel and myself met at CES 2017 a few weeks ago, so the 2nd half of our discussion is about what we both liked the most at the show and where we see the future in technology. We talk a good amount about 3D printing and Virtual Reality (VR). Scott Houdashell is an insurance salesman by day but an inventor at his core. One day he was decorating a hardboiled egg with his family and thought there must be an easier way. After some testing and trials, the Eggmazing was born. 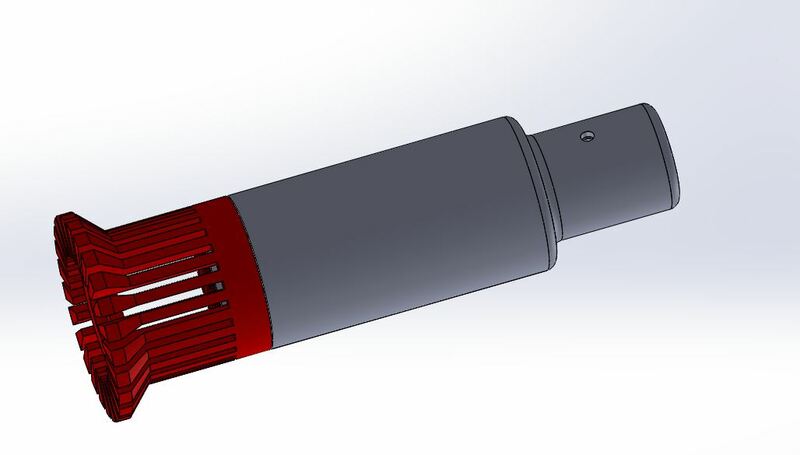 I first connected with Scott when he needed his Sketchup drawings converted into Solidworks drawings. He has since already gone to tooling with his product and he had a successful Kickstarter campaign. He is on the verge of a big breakthrough and our conversation will show you how he went from an idea to a final product. Tu-Hien is a mom who lives in Florida. She had her first child a few years ago, and found that using a breast pump was very uncomfortable. She went online and couldn’t find a product to solve her problem, so she set out to solve it herself. She created a Facebook group of moms to use as her focus group / testing group. She went through 41 iterations to come up with the perfect final product. Then she launched and completed a successful Kickstarter campaign to fund the injection molding tool. We discuss all the steps she went through to bring her product to market. Try and try again. It takes many iterations to get it right. It took Tu-Hien 41 iterations to perfect her project. Kickstarter is a great way to raise money for your project. But in order to be successful, you need to prepare in advance by building an audience for the campaign. This week we have Carl Friesen. He is from Toronoto, CA and his background is in Journalism. He currently helps people get recognized for their expertise and helps authors get published. Carl talks to me about how I can get more recognition in my field of CAD and Product Design. We talk about doing speaking engagements and writing articles on my field. While I already do both things, I can always do more and Carl gives me some great advice. Whether you are a mechanical engineer, civil engineer, industrial designer or even an inventor, this conversation will really help you in your career to establish you as a though leader. That can make a real impact on your success! It is important to focus on the trade publications in your niche. While not a lot of people might read that magazine or blog, those that do read it are very interested in it. Will Gibbons is a Training Specialist at Luxion, the makers of KeyShot rendering software. He’s got a degree in Product Design and experience in marketing, product design and development and visualization. Will has experience in more CAD programs than anyone else I know. We discuss many of the different programs out there and give the pros and cons of each. I mainly use Solidworks so this conversation really opened up my eyes to the different options when it comes to CAD. If you currently use CAD software or are interested in it, you will find a lot of value in this conversation. Make sure you stick around to the special section at the very end, Will and I go into some extra discussions on Z-brush (a program used to create these masks). Andrew Bougie has a background in general IT and has (until recently) worked for a ScanSource, a company that sells 3D scanners. During his time there, he learned a lot about 3D scanning by getting hands on with the scanners and answering customer calls about scanner issues. Andrew told me that he always wanted to own his own business and he had some side hustle jobs in the meantime. But he recently decided it was time to go full time with his knowledge of 3D scanning and start a business. With the help of a business partner, he started Digitizedesigns.com, which a service that provides 3D scanning services. During our talk, we start with his journey so far. Then we move into the nitty gritty of 3D scanning. If you ever had any interest in learning about 3D scanning, then you need to hear this conversation. Rick has a background in designing juvenile products. Some of his past jobs included both working at Hasbro and Fisher Price. He later broke off on his own and has licensed 4 different toys that he designed. His most successful invention netted over $300,000! We discuss how he achieved these license deals and he explains that you don’t need to be an engineer to be like him and create something very profitable. Justin Shook is the founder of shookideas.com. His company manufactures products for others as well as products his company has designed. He is a firm believer in the power of 3D printing and all of his products are 3D printed. He currently has a lineup of Ultimakers and a Form Labs SLA printer. We talk about how Justin started in 3D printing, how he has come up with unique products made with 3D printing, how not all products have worked out and his advice for other entrepreneurs who want to get into designing and selling products. Not all products will be a big hit nor will they all go the way you planned. Justin explained that one of his products flopped, despite testing on his end. Be in business to be the best you can be at providing that product or service. Don’t simply be the least expensive. Iain Power is a mechanical engineer with 20 years of experience in design engineering and entrepreneurship. He has worked in aerospace and automotive industries with experience designing plastic and metal parts. We talk about how Iain got started in design, how he has expanded into freelancing and his best design to date which you affects your everyday but you probably have never even noticed it! Oh and it also helps the environment. This week on the show we have Josh Nicholson. We discuss his best security design, how he got started in his career, his various entrepreneurial jobs, and his advice on how to advance your technical career with entrepreneurship. Chris Padgett is a mechanical engineer from NC state. He has 6 years of experience in 3D printing and has worked for defense contractors and in the enterprise mobility space. He currently works as the CEO and founder of Fusion3D printers. We talk about how Chris went from his corporate engineering job to starting Fuison3D. He gives a history of his journey and some great lessons learned. John is a Mechanical Engineer from NC State with a passion for inventing. He has invented products such as wooden Chinese throwing stars, reflective address signs, special pressure washer nozzles, and a device for hanking rope (if you don’t know what that is, then listen in!). Joe Moya is an industrial designer by degree and is now a business owner. He runs Studio Moya, which is a full service product design firm based out of Columbus Ohio. He also has created the Hilljak brand, which is a performance magazine loader. We discuss Joe’s journey to where he is today as well has how he invented the Hilljak line of products. Anyone who is interested to learn how to successfully launch a brand (which is more than just a product) needs to hear this podcast! I learned quite a bit in my discussion with Joe. 1. Before selling a product, it is a good idea to create a brand first. This is something I could do better. You need to create a logo and package to go with the product to create the brand. 3. Lastly, keep your eye open for opportunities. Joe has created a very successful “passive” income source by solving the problem of reloading firearm magazines. Solving your own problem can often lead to a successful business. Derek Timm graduated college with a degree in business. After college, he took a job as a paper pusher (his words) and was able to transition into a product designer/CAD position. He found his passion in design and his experience and expertise has grown since. He even started his own side business. We discuss Derek’s path so far, some projects we have done together, and where he is headed with his new company. This week we have Lyman Bishop on the podcast. Lyman is a mechanical engineering and entrepreneur. His background is mainly in weapons and defense (body armor). He runs both his own company for product design (www.star-labs.com) and he is in development of his own line of body armor after working for years in that space. We discuss a story of how he got started as an engineer at 8 years old, how body armor is built (I learned a lot here), and the pros and cons of manufacturing in China. There is a ton of value in this episode so you don’t want to miss it! This week is a little different. This week I talk about my recent invention, The Selfie-Glove. I started this project in August and I have just made my first 2 sales. In this podcast, I talk about the lean startup philosophy and how I have applied it to this product. I discuss how I used validated learning to improve the product and find the right market. I discuss how I came up with the idea, how I filed a provisional patent, how I made my prototypes, how I got feedback on the product and how I made my first few sales. If you are at all interested in learning about how to invent something, you need to hear this podcast! Here are the links discussed and how to get in touch with me to learn more. This week on the podcast we have Louis Foreman. Louis is the CEO of Eventys and Edison Nation. His companies help inventors take their product to market. We discuss Louis’ background (he has 7 patents! ), how he started his companies, and some tips. As with any entrepreneur, we discuss some successes and failures. There is a lot to learn in this podcast! Inventing doesn’t have to be done on your own – Edison Nation offers an option to submit ideas for partnership. This week on the podcast we have Anthony Fasano. Anthony is civil engineer by background. He has shifted his career from practicing civil engineering to becoming an entrepreneur in a few different areas. He is the Executive Director for The New York State Society of Professional Engineers, he runs the Engineering Career Coach podcast, and he runs The Italian American Podcast. Anthony reached a high level of management at his engineering company at the age of 27 but he wasn’t satisfied with what he was doing anymore. We discuss how Anthony made his career change and how he found his true passion, which is helping engineers develop their career. The engineers that are successful have powerful core skills. Skills like effective communication and the ability to speak in front of people.